So I guess it's now time to see how I've done with this! - I will aim to keep up a good level of activity, with no fewer that 6,000 steps in a day It's been an incredibly rare day when I've not achieved this and my daily average over the year is currently sitting at over 13,000 so I think I can call this one done! - Continue with eating well, using the FitBit to log foods some days to keep on track. This has continued to work really well and I've maintained my weight through the year using this method - so again this will be repeated for next year! - Exercise at least 3 x per week - more is fine. Gym, running, swimming, circuits, HIIT Sessions - all good. Aside from points when injury has got in the way I've maintained this one pretty well and over the year I have regularly taken part in a good range of different activities too. - Stretching is good and helps facilitate the exercise. Ideally a full stretching session at least once per week and mini sessions scattered through as well. Going to "amber light" this as needing to be more of a priority for 2019 and beyond. I have done a fair amount but have also identified areas and specific muscle-groups where I could benefit from a lot more. - Continue using my Bullet-ish journal to help with planning and general organisation WIN! Again use of it dropped off a bit during the very busy summer months though so something to focus on - I've also refined the way I use it to a degree which in itself helps with actually making sure I DO use it. - Do Parkrun - either our local one or another, it doesn 't matter which, just DO IT! Yes - done our local one in Harlow a couple of times and also nearby Gunpowder park in Enfield. Have established that I don;t like Harlow much because of #ThatHill but as I have a certain hill-related challenge for 2019 already in mind I may need to make use of it a bit more for training for that event, if nothing else! - Visit the local climbing wall for a session. Finally did this in November and I'm inclined to say that it might be the one single achievement that I was most proud of from my year. - Decluttering at a low level - focus on seeing items within the house that we don't use This has happened but probably needs to continue to happen as an ongoing thing. - New coffee table for front room - this is a quality of life thing. We have now established that the one we saw previously MrEH is not that keen on so the hunt continues. Back on the list...! This is one major area where we did FAR less than we were intending to. Several reason - the electrician that we found who we *thought* was going to be a great person to use seems to have let us down - we will have one last attempt to get him on the case early next year and then will have to look elsewhere. The hallway and plastering can't be done until the electrics are dealt with - so this loops right round on itself. I'm inclined to say that I suspect we could have pushed this one forwards more too - but I rather feel that perhaps it was just too soon after all the upheaval with the kitchen to go through another lot of household turmoil - more recovery time was needed! - Joint savings to continue as they are Yes - really good progress on savings again this year! - I will keep a good eye on interest rates and make the most of any access we have to higher interest savings Again - we've kept on top of this changing the account that was going to lose it's bonus rate at the right time and keeping up with money going to 5% interest rated regular saver accounts within the limit that those have imposed on them. - 0% card must be cleared by the end of October, and again as far as possible this needs to be done without touching savings. This was done, and in the end it was cash neutral to within about £40 if I recall correctly. - keep the extra savings ticking over to ensure that our Lundy trip in the spring doesn't have to be paid for from savings. The account which was formerly our "mortgage OP account" has indeed been ticking over on a monthly basis - we still use it for the "money we've saved" on utilities, Sky, that sort of thing, as well as the small surplus from my monthly salary, and sometimes a small surplus from our joint account too. This has actually paid for TWO Lundy trips! - Refocus on the small stuff - the odd frittering, and the impulse spends that have started to creep in a little. Frugal February helped with focusing back on this and we're back into the habit of spending mindfully now. We certainly aren't "frugal" to the extent that we used to be when paying off the mortgage was a priority but we've discussed this and are happy with where we're at - we are in a different place financially now and the work we put in at that time has enabled that. - "Frugal February" to assist with the refocusing on the small stuff. Yes - covered above. - Stop and think before acting This also comes under the heading of "mindfulness"
- Be conscious and mindful. Think about the choices I have, and those I make going forwards In part this is again to do with the conscious choices I have made. - Tidy up laptop in readiness for the new Airshow Season. I did. And now it needs it again! - Continue with volunteering stuff Yes - although it went in a different direction mid year. We also took on a new commitment which is going to mean an adjustment of our free time for the next few years I think. - Try to tick a couple more items off our big "We want to..." list. Yes - a helicopter ride and also visiting a specific RSPB reserve that we wanted to get to. I'll talk about the items above relating to other people as a single entity I think. I made some very conscious decisions this year - to remove some people from my life and to spend time with others, sometimes instead, other times as well as. I've refined those I see as "friends", and there are others who are now definitely in the "acquaintances" camp - and that suits me well. Bridges have been built in one area also and some misunderstandings hopefully now ironed out which is good. My conscience over a particular situation now sits more easily and comfortably. I have a far clearer view of the sort of people who add value to my life - those who are genuine, who do things to experience rather than to be seen to be doing them, those who actively seek to spend time with me for me, not because of other factors, those I actually like more, the more I get to know them! I've also remembered that the more you spend time with people like this, the less you need to worry about your reaction to unkind things said by others as the situation doesn't really arise, so another win there. All in all I'm calling it a pretty successful year. On the running front I had a vague list of places I'd like to run - the Olympic Park, in central London, and on a beach were key ones, and I have ticked off all of those as well as "on Lundy" which was pretty good. Part way into the year I was also challenged by a social media pal to see which of us could get to 365km for the year first and I was delighted to record my tally by the end of November. Also said I wanted to run in a regular group with others and RunTalkRun has given me the chance to do that - and that is something I definitely want to continue with in 2019! Now it's time to start thinking through plans and challenges for the next 12 months - I'll be posting on that in the next few days. Some things will be a straight copy across as they are just as valid to keep up with. Some stuff will be new and I have some solid ideas there already too. My aim for this was partly to get back to routines - running, keeping on top of organisational things at home, and the day-to-day stuff that makes life easier. Partly to kick-start my exercise plans again at a time of year when sometimes it can be tough to motivate yourself to lace up and get out. I also wanted to focus on "Wellness" generally, physical AND mental health, and give our meal plans a bit of a shake-up with new ideas, maybe some new recipes and some different ingredients. 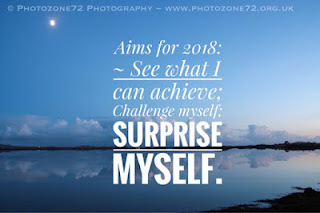 Finally I wanted to take some time to see where I have achieved this year already in terms of my start of year challenges, and where I might still want to have one last push to thoroughly tick a box. I decided that I wanted to lose a few lbs in weight to get back to my "ideal" weight ahead of the Christmas season and all the extra food and drink that sometimes entails. Exercising an average of 5 days per week would help with this as would getting back to running more regularly - with airshows and the summer's high temperatures my routine on this one had definitely slipped a bit. Similarly looking for some fresh new ideas for meals should also help to keep our food interesting and avoid the feeling of having slipped into a rut with what we're eating week on week. I'm sticking with the plan that has worked so well for me of tracking and logging the food I eat 4 days a week, then relaxing over weekends. The organisational stuff ties in with the overall wellness picture as there is no question that for me, feeling as though clutter has built up, or that there are things that we "should have done" that we're putting off plays hell with my mental health. As I've mentioned previously on here, the darker/shorter days can also be a trigger for me mentally so this is a good time of year to be proactively tackling ways of dealing with anything that might have a negative effect. I love a challenge as you know, so decided to post daily on Instagram to keep up the accountability. I managed to miss one day entirely at some stage, and only realised a few days from the end that I was running behind, and did have to combine two days into a single post over a busy weekend, but generally I did keep up with this daily posting. I intended to do some blog posts, but that didn't happen, and I posted regularly on a private forum that I'm part of with updates on how I was doing - and got masses of support in return, too! The running regularly started well with me increasing my longer run distance up to 7 miles and a total of nearly 15 miles covered in the first 8 days of the November but my run on the 8th had to be cut short as my hip was extremely painful and I wasn't able to run again for over 2 weeks which knocked my plans a bit. Managed 9 runs in the 40 day period in the end which in real terms, allowing for the 2 week hiatus in the middle, was actually somewhere close to where I was aiming. I also managed to get two runs with the RunTalkRun group in there too which was good - it's not always easy for me to make their runs not being London based but I love it when I can join and one aspect of the challenge was wanting to fit in more social running too! Lesson also learned about not trying to run on multiple consecutive days - my joints simply don't like it! Other exercise across the month consisted of a swim, masses of walking and lots and lots of strength and stability work - something which I want to keep up the focus on going forwards - as well as a couple of Metafit classes. By the end of the month I had also clocked up over 365km for the year thus "winning" a mini challenge that a friend had set us on Twitter to see which of us would be the first to reach that particular milestone in the year. On the food front I looked for ways of mixing up some of the meals we have regularly with differing ingredients and flavourings, using more fresh herbs for example. Remembered how much I love brown rice rather than white, and finally managed to successfully poach an egg! Bought some wholewheat pasta but haven't used it yet, generally managed to step back from snacks "for the sake of snacks" and make healthier choices when out and about. At the time of writing my weight had headed back to pretty much where I want it to be which was the aim - if I can trim off an additional few pounds ahead of christmas I'll be happy enough. One BIG challenge I overcame during this period involved attending the local climbing wall for a trial session - pretty much everyone when I said how much this worried me assumed that it was because the height scared me - in fact nothing could be further from the truth, those who know me well are aware that height has never phased me in the least! In fact as someone who is severely claustrophobic it was the fear of getting stuck that made this one truly terrifying - I've always been hesitant about climbing steeper hills as much as anything else because I'm afraid that I will find myself in a position I can't get out of - and this was one reason for wanting to challenge this. I was shaking like a leaf when I arrived but once the session got underway and I saw others climbing I relaxed a lot and eventually managed two climbs to the top on suitably easy routes. SO pleased to have done this and more than a little proud of myself as this was definitely a big thing for me! I'm going to be taking a lot forwards from this challenge - and a lot of this ties in with stuff in my wider 2018 challenges too. Organisation and using my bullet-ish journal to keep on top of things - this is a winner all the way for me - each and every time I return to using the journal life gets easier. I'm making it less structured though with a straightforward list for each week, using the standard bullet journal arrow system to "forward" things on to do in a future week. More than two arrows on an item lead to a questioning of why I don't "JFDI" or "Does it actually need doing?". Similarly is SLEEP - I need more of it than I often get, and when I get more of it, life is easier again. This is another area where forming a habit really helps. Strength & stability exercises - I need to remember that I NEED to do this stuff to carry on running - the stronger I am, the less prone to injury I will be, and with my temperamental joints, that's a key thing. (See also "Stretching" on this one!) And in fact on the subject of the strength/stability/stretching stuff this is somewhere else I can form a habit which would be beneficial. I've now started thinking about 2019 - and also back to all the stuff I've achieved and the targets I've hit this year. I'll try and do another post as the end of the year approaches specifically on my 2018 challenges - I'm really looking forward to going over those!